I am student of University of Madras completed my university exams looking for the consolidate mark sheet. Will you provide me complete process how to get consolidated mark sheet from University Of Madras and list of required documents required o get consolidate mark sheet? The University of Madras is a public state university in Chennai, Tamil Nadu it was established in 1857, it is one of the oldest and premier universities in India. The university was incorporated by an act of the Legislative Council of India. Consolidated Mark Sheet is a single mark sheet that lists all the courses and grades of all the semesters of your study. 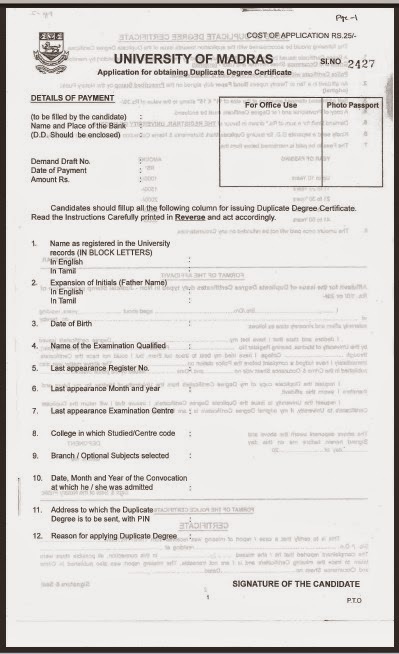 A letter requesting for a consolidated mark sheet along with details such as your name, address, phone number, course, college, batch, registration number and DD details. A non-refundable demand draft drawn in favour of THE REGISTRAR, UNIVERSITY OF MADRAS. A photocopy of your consolidated mark sheet (For re-application - if you have already obtained and lost). A self-addressed envelope of size 11" x 15" stamped for Rs.30. The amount varies with your year of passing. How many days you will take to give consolidated mark sheet. Hi, I have sent DD, cover letter requesting for consolidated mark sheet along with my copies of provisional and transfer certificates to Registrar, Univ of Madras and a return stamped envelope. It has been a month now, does anyone had similar issue as I just want to know how long it takes to receive as I'm cutting close to applying for school in States. Appreciate anyone's input here. thank you. Hi, any luck in receiving mark sheet? I have applied almost a month now requesting for consolidated MS.
Around 15 days from payment of fees.